In Indy there is a restaurant called The Tamale Place. While I’ve never actually eaten inside it, I have been lucky enough to enjoy their cooking on several occasions. We residents take turn bringing in breakfast on Friday mornings, and my friend Adam was the first person to introduce me to this little gem of our city by bringing it one Friday. His Thursday afternoon email had me feeling a tad skeptical…”Breakfast tacos? What are those? Do I really want to eat a taco for breakfast?” When I tried it the next day, it honestly blew me away. 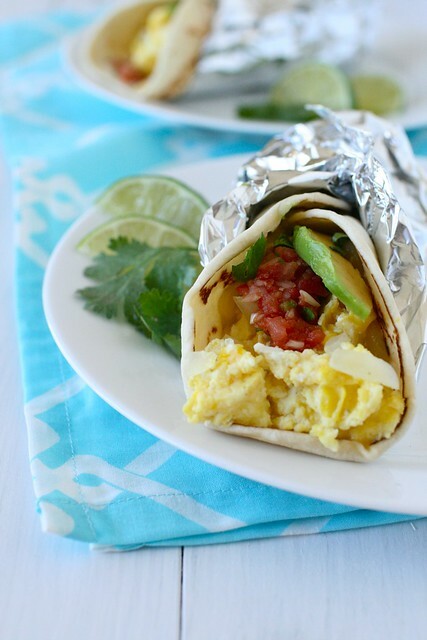 The concept is fairly simple – a fresh tortilla, melted cheese and scrambled eggs topped with some salsa. They also have varieties including steak or chorizo mixed in. As good as all of that sounds on its own, the whole is way greater than the sum of its parts. At first I thought it may have simply been the uniqueness of it, the sheer joy of something breaking the routine of bagels, muffins, etc. The change of routine is certainly welcome but in the end, it is the dish itself that deserves the praise. Despite my extreme excitement each time the tacos are brought into work, I never considered the idea that I could replicate this favorite restaurant dish at home. When I saw my friend Jenny post this version, I jumped for joy. I could tell it would be very similar, and it hit the nail on the head. Unfortunately my grocery store was all out of any type of cheese that was even remotely close to what the recipe called for, so I just bought something vaguely similar. Good news – most cheeses will work. Normally my favorite type of taco from The Tamale Place is the kind with chorizo but at home I opted for a meat-free version. These were so good, I know for sure what I’ll be doing with the chorizo sitting in my freezer right now. I can’t wait to make these again and if you’ve never had a breakfast taco before, I recommend you change that at your earliest convenience. And by the way, stay tuned for a post about making your own tortillas. I can’t wait to share them with you! In a non-stick skillet, melt the butter over medium-high heat. Add the onion and cook until slightly softened, about 3 minutes. In a bowl, lightly beat the eggs with a fork and stir in a splash of milk. Add the eggs to the pan with the onion and scramble, stirring occasionally, until cooked through. Season with salt and pepper to taste. Warm the tortillas for about 20 seconds in the microwave. Top each tortilla with half of the cheese. Divide the eggs between the tortillas and layer over the cheese. Top with the cilantro, salsa, and avocado as desired. Fold up the tortillas and serve immediately.